L-R: Alex Harvey (RIVR), Alex Foster (RIVR), Paul Bennett (Coventry University Enterprises Business Solutions) and Paul Speight (Leicestershire Fire & Rescue Service). A Midlands-based company that has developed ground-breaking photorealistic virtual reality experiences is gearing up for global expansion – just one year after launching. Southam-based Reality In Virtual Reality (RIVR), which launched in March 2017, has had financial assistance from Coventry University Enterprises (CUE). This funding has allowed RIVR to take virtual reality training to the next level by scanning any real-life environments and importing them into a virtual reality world. The project won support from CUE’s Technology Start-up project, which is part of the Coventry and Warwickshire Business Support Programme and is part funded by the European Regional Development Fund. 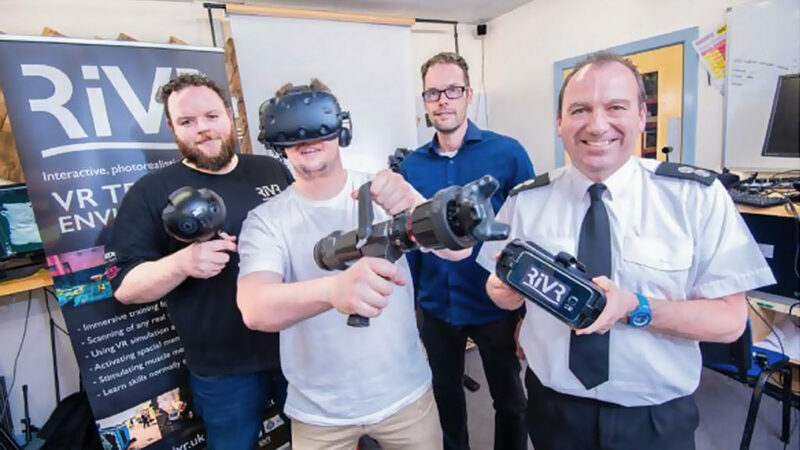 RIVR employs a team of developers, artists, modellers, creatives, drone pilots and videographers and has been working with its first partner, Leicestershire Fire & Rescue Service, to develop virtual reality training scenarios for firefighters relating to fire investigation, breathing apparatus and driver training. This involves 360 degree videos for static observational viewing, and virtual reality room scale scenes where users interact with virtual objects to enhance muscle memory and knowledge retention. The developers, based on Kineton Road Industrial Estate, are also currently working with other organisations such as the UK Home Office and UK police force, as well as the National Institute of Standards and Technology (NIST) in the USA. Alex Harvey, CEO of RIVR and Paul Speight from Leicestershire Fire & Rescue Service are set to present the virtual reality training project at the Fire Department Instructors Conference in Indianapolis, which is attended by around 35,000 firefighters from across the USA. “The photorealistic virtual reality we are offering adds a more serious, productive use of a technology that currently provides enjoyment for millions of gamers around the world. “This game-changing photorealism now means that, for example, emergency services colleagues can learn skills that would normally have to be taught in dangerous situations. As opposed to gaming virtual reality, users will get all of the benefits of being in a real-life situation, but without the hazardous risk. “Another key unique selling point for our software is the Virtual Reality Monitor system that allows the training departments to record any scenario and watch back the training from any location in the world. “The realism of the experiences we have created for Leicestershire Fire & Rescue Service has really hit home with people and has led to us securing work with other organisations, and even enquiries as far afield as Brazil and Columbia. Paul Bennett, technology business advisor at CUE Business Solutions, supported Alex through free professional finance and marketing workshops, which enabled RIVR to eventually secure a directors loan to provide an upfront cash injection, as well as targeting relevant trade shows. CUE Business Solutions also helped RIVR to secure a £27,000 grant from the European Regional Development Fund. “A lot of new businesses need significant investment up front just to operate before they can start getting paid for work completed and generating a positive cash flow. “The workshops we have provided, combined with our ability to apply for grants, has seen the firm experience a successfully stable first year. “There’s no doubt that Alex and his team have a product here that is set to take off, and they have now created a stable platform where they have all of the equipment and personnel needed to begin growing and targeting six trade shows during 2018 to expand their client base.